HONOLULU – As part of the annual “Beat the School Jam” campaign, the Hawaii Department of Transportation (HDOT) detailed the implementation of several projects that will help alleviate traffic. It continues the HDOT focus on safety and system preservation projects that use far less money and time to finish. As part of Governor David Ige’s initiative to reduce traffic, HDOT is implementing several improvements designed to keep motorists moving. Below is a list of projects that have been implemented prior to the start of the Beat the School Jam. The Zipper lane now accommodates two lanes of traffic from the H1/H2 merge to the Pearl Harbor area. The improvement expects to add 20 percent more volume within the Zipper lane which will help carpool vehicles move more efficiently, while also reducing the amount of vehicles in the single occupancy lanes. The Zipper lane hours have been extended 30 minutes and is now available from 5:30 – 9 a.m. weekdays, excluding holidays. As it has in the past HDOT will suspend construction-related road closures during daylight hours on major highways from Aug. 22 through Aug. 26 to alleviate traffic congestion during the week when more than 53,000 university, college, and private school students begin their fall semesters. During the daytime construction break at the start of the school year, emergency closures, nighttime construction, and roadwork that does not involve lane closures, such as shoulder maintenance or landscaping work, may still be scheduled. The Beat the School Jam campaign includes radio commercials that will air during the morning and evening commutes reminding people to plan ahead, consider carpooling or public transportation and watch out for children walking or biking to school. Most importantly, drive smart and safe. On average children are involved in 109 pedestrian and 48 bicycling accidents a year in Hawaii. People have the power of information in their hands. With a little pre-planning drivers can see what traffic conditions are ahead of them before they start driving. The GoAkamai.org website and app are available to provide up to the minute traffic conditions. It also has MyGoAkamai, which is a free personalized alerting service to your specific route with freeway alerts such as accidents, construction or other lane closure information. Whether traveling a short distance or across the island, people should check conditions before every trip to plan the best route. Simply register at www.GoAkamai.org for this free service. The registration process for MyGoAkamai allows users to select from a number of predefined trips, identify the types of events that are of particular interest, decide when alerts should be sent, and whether they are to be received by email or text. GoAkamai is able to support users, whether they’re accessing it on their desktop, laptop, smartphone, or tablet. Whether using GoAkamai.org or any of the other free traffic tools and applications available, HDOT strongly encourages drivers plan ahead and look at traffic conditions before starting their vehicle. Beginning on Monday, Aug. 22, motorists are advised to adjust their commute times accordingly to avoid peak travel periods and are reminded to properly maintain and inspect their vehicles to avoid becoming potential road hazards. Transportation alternatives include biking to work, taking The Bus, and signing students up for public or private school buses. Carpooling or vanpooling with a neighbor, friend, coworker or classmate can also allow motorists to utilize both High Occupancy Vehicle lanes (two or more individuals per vehicle) on our state highways and freeways. 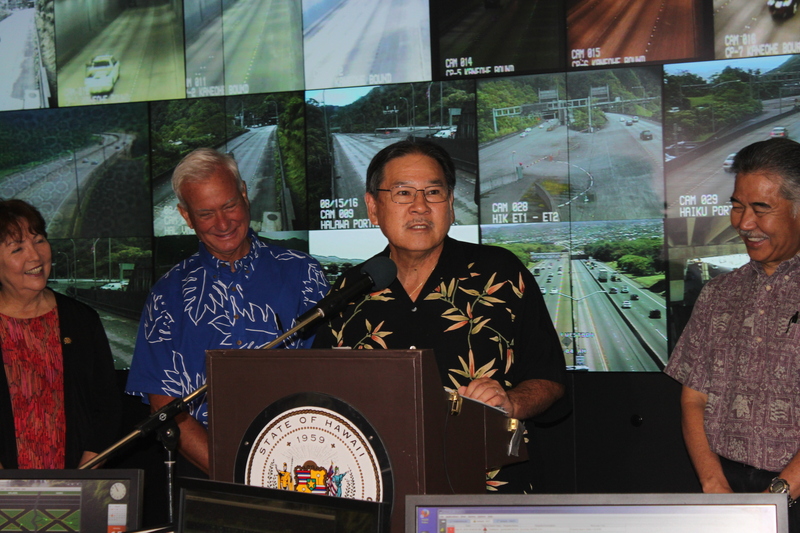 HDOT Director Ford Fuchigami (at the podium), along with State Senator Michelle Kidani (left), Honolulu Mayor Kirk Caldwell and Governor David Ige, announce the annual “Beat the School Jam” campaign to encourage the public to plan ahead and inform motorists of the latest traffic relief improvements projects. Accident information is based on a three year average from 2009-2011 for children younger than 18 years old involved in a major traffic accident as a pedestrian or bicyclist in Hawaii.